The Italy City Council will meet today, Monday, May 14 at 6:30pm in the Council Chambers of the Italy Municipal Building, 105 West Main Street, Italy. The council has a full agenda tonight that includes a presentation to the DCI Scholarship winner, proclamations regarding National Police Week and National Nursing Home Week. Discuss and consider necessary action(s) regarding a request from Josh Trees to permanently zone 617 Mosley St. from Single Family Residential District 2 (SF 2) to Light Industrial (LI), on approximately 0.89 acres, know as tract 1 and 2 of Ed Harrison Survey abstract 512 on U.S. Hwy 77, Italy, Texas, according to the plat recorded in volume 2397, Page 920, Deed of Records, Ellis County, Texas generally known as 617 Mosley St. Italy, Texas 76651. 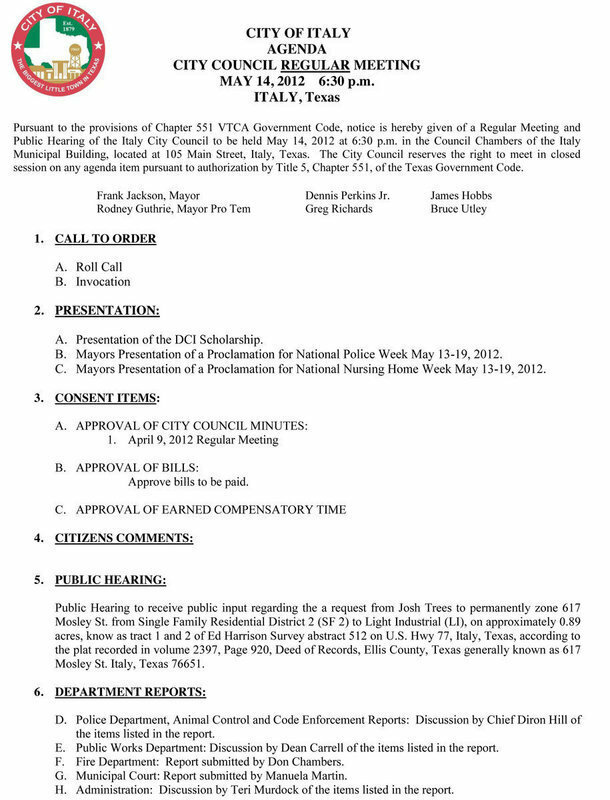 Discuss and consider necessary action(s) regarding a written request from Ronnie Hyles to review Ordinance No. 00-08-01 regarding all commercial off premise signs within the City of Italy. Discuss and consider necessary action(s) regarding adding painting the water tower to the Water Bond Project. Discuss and consider necessary action(s) regarding Resolution No. 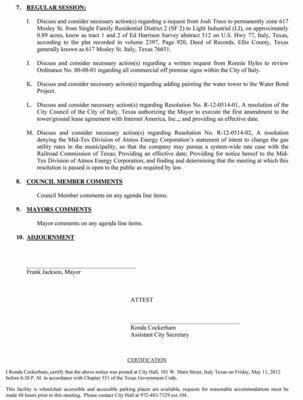 R-12-0514-01, A resolution of the City Council of the City of Italy, Texas authorizing the Mayor to execute the first amendment to the tower/ground lease agreement with Internet America, Inc.,; and providing an effective date. Discuss and consider necessary action(s) regarding Resolution No. R-12-0514-02, A resolution denying the Mid-Tex Division of Atmos Energy Corporation’s statement of intent to change the gas utility rates in the municipality, so that the company may pursue a system-wide rate case with the Railroad Commission of Texas; Providing an effective date; Providing for notice hereof to the Mid- Tex Division of Atmos Energy Corporation; and finding and determining that the meeting at which this resolution is passed is open to the public as required by law.